List building is still one of the most powerfully effective marketing methods in existence today. Funny enough, one would think that social media and all the many advertising outlets and platforms out there would’ve replaced email by this point. But it never happened. Everyone still has an email account and still uses their email daily. More people will read emails than they will tweets, Instagram posts and Facebook posts by a wide margin. That’s why list building is still so important and is the number one way to get in touch with your customers unless you’re world famous with millions of followers. Chances are you probably don’t have multi millions of followers where a single tweet promoting a new product will cause a frenzy with your followers rushing out to the stores that very minute. In the world of marketing, you need to know how to create, grow, communicate and market to your list like a top level marketer. Many new marketers will struggle which is why you need to get on the ball if you’re in the same boat and want to truly learn how to build a real responsive list. 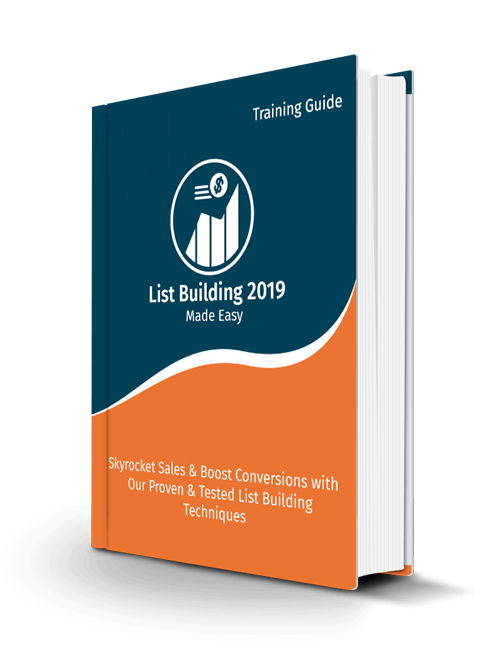 This guide which also includes the List Building 2019 Made Easy video course will show you what’s working today. This step by step course is what you’re needing if you’re ready to take your list building efforts to new heights. You’ll learn how to create lead magnets, setting up your campaigns, creating powerful landing pages, converting visitors into subscribers, blogging like a pro to grow your customer base, setting up pop-ups and opt-ins, using bonuses to perfection, using LinkedIn groups and YouTube ads to gain even more subscribers, utilizing surveys, optimizing confirmation pages, implementing various social media tricks and much much more. The most valuable thing to any company or marketer is their list. When the world comes crashing down, you’ll still have your list to sell to. That’s what makes it so important. So if you’re serious about building a real list full of real buyers, grab this course now. Package includes a professional sales-letter and ready-to-go sales materials.